Like many people, I am big on self-exploration and reflection and "finding myself." I love taking quizzes. I love memes about my Myers-Briggs. (I'm an INFJ, by the way.) It's fun and can be quite illuminating. Enter Potterverse. It has been said that seeing someone reading a book you love is like a book recommending a person, but the Potterverse fandom is 1) large, and 2) has a wide variety of personality types built into it already. Getting sorted into a Hogwarts house is such a big thing that even non-Potter fans have heard of it, and there are countless internet articles sorting anything and anyone (including Myers-Briggs types) into the four houses. There are also countless sorting quizzes all over the internet, and not a single one is perfect, but the one I recognize as canon is the one at Pottermore.com, because it's the official JK Rowling-written-and-approved Potterverse website. You can take the Hogwarts sorting quiz, as well as quizzes to find your wand, your Patronus, and your Ilvermorny house, and all your results will be listed together in your profile conveniently for you. I know what being Gryffindor means, but I've never really taken an in-depth look at all my Pottermore results put together, so today, I decided I would go ahead and jump head-long into this rabbit hole and put together my own Potterverse psychological profile, based on the writings of Pottermore, as well as some various sites around the Internet. So, I actually want to start with my wand, because it might be the simplest to explain, and besides, the wand chooses the wizard. This jet-black wand wood has an impressive appearance and reputation, being highly suited to all manner of combative magic, and to Transfiguration. Ebony is happiest in the hand of those with the courage to be themselves. Frequently non-conformist, highly individual or comfortable with the status of outsider, ebony wand owners have been found both among the ranks of the Order of the Phoenix and among the Death Eaters. In my experience the ebony wand’s perfect match is one who will hold fast to his or her beliefs, no matter what the external pressure, and will not be swayed lightly from their purpose. This is the rarest core type. Phoenix feathers are capable of the greatest range of magic, though they may take longer than either unicorn or dragon cores to reveal this. They show the most initiative, sometimes acting of their own accord, a quality that many witches and wizards dislike. Phoenix feather wands are always the pickiest when it comes to potential owners, for the creature from which they are taken is one of the most independent and detached in the world. 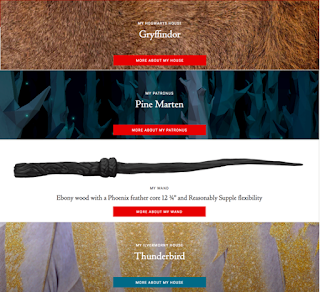 These wands are the hardest to tame and to personalise, and their allegiance is usually hard won. There is a little info about wand length and flexibility, mostly addressing extreme occurrences in both cases, and my wand seems to be in the middle for both. Interestingly, REALLY long wands are considered to be over 15" longer, and those wands are usually drawn to wizards/witches who have a physical peculiarity. Mine is well within "normal" range for length, but you know, on the longer side. I don't know if I am considered physically peculiar (as a plus-sized woman who is close to being able to squat and deadlift 500 pounds), but it's an interesting thing to think about. The most recent quiz to be added to Pottermore, the Patronus quiz caused quite a stir because people weren't really sure exactly where the heck a Patronus was supposed to be. I mean, in the Potterverse, your Patronus is a conjured animal that can protect you from Dementors because it is based on your happiest memory, but people were confused whether these animals were supposed to symbolize you or reflect your personality or what. I was definitely confused when I got my result because I wasn't even sure what a pine marten WAS. And how can it be my protective animal if I didn't even know what it was? No reliable system for predicting the form of an individual’s Patronus has ever been found, although the great eighteenth-century researcher of Charms, Professor Catullus Spangle, set forth certain principles that are widely accepted as true. The Patronus, asserted Spangle, represents that which is hidden, unknown but necessary within the personality. So I'm like, Hmm, okay... Somewhere deep inside me, I've got a dormant pine marten characteristics that will come out when faced with evil. So what are these characteristics? Gryffindor is the "hero" house, because Harry, Hermione, Ron, and most of the heroes of the Potterverse are in it. We're the "good guys," although, it's kind of a skewed viewpoint because the story is more or less being framed by Harry's perspective. Even though I AM a Gryffindor, sometimes I feel embarrassed admitting to being one because Gryffindor is the house that kinda gets shoved in everyone's face. :P Also, even though Pottermore officially sorted me there, I still question whether it's my correct house (as the house that values courage, chivalry, and determination), but my friends swear up and down that I am TOTALLY Gryffindor, so I embrace it. If you're a Gryffindor/Thunderbird, you're a person who might come off as a little temperamental or flighty, but deep down you're a really rational person who tends to surprise people with the depth of your thoughts. Anyway, I don't know what all this means together, but now it's all in one place for me to ruminate on some more :) Personality profiling is a huge, interesting field of study, and when you take into account the fact that all of the above is based on one (expansive, immersive) fictional universe... it's pretty mind-blowing, the work that JK Rowling put into all this. I may not agree with everything she says or does, but I do have to tip my cap to the world she created and to all the fans that keep it alive.